There are two main types of persimmons, the Hachiya and the Fuyu. They are also sometimes referred to as the American and the Japanese. It is unknown whether they were native to America or brought here from Asia. It is known that native indians ate them, but (probably due to word of mouth after tasting an unripe Hachiya) they were not popular with the Europeans who settled here. fully ripe when eaten. This variety is best for baking. The Fuyu is round like an apple. It is non-astrigent. 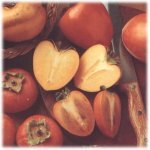 This persimmon has a wonderful flavor and is growing in popularity. We grow both varieties at Rhodes Family Farms, but the Fuyu is our main fruit. It is surprising how many people have never heard of the Fuyu, most have only tasted the Hachiya. Some, people won't even taste a sample, because they have unknowingly tasted an unripe Hachiya. The first video gives us the secrets to drying Hachiya Persimmons directly from Japan. The second video is from Australia and showcases a ripe Hachiya and how absolutely beautiful the tree is when the leaves turn color.